Our colleagues in the GOV.UK Email team send out notification emails to around 750,000 GOV.UK users who have signed up for alerts about significant content changes. Government as a Platform Programme Director, Ashley Stephens, announced yesterday as part of our #GovPlatforms week, that the GOV.UK Email team is now using the GOV.UK Notify platform to deliver email notifications. GOV.UK Notify is now processing an extra 500 million messages a year because of this migration. 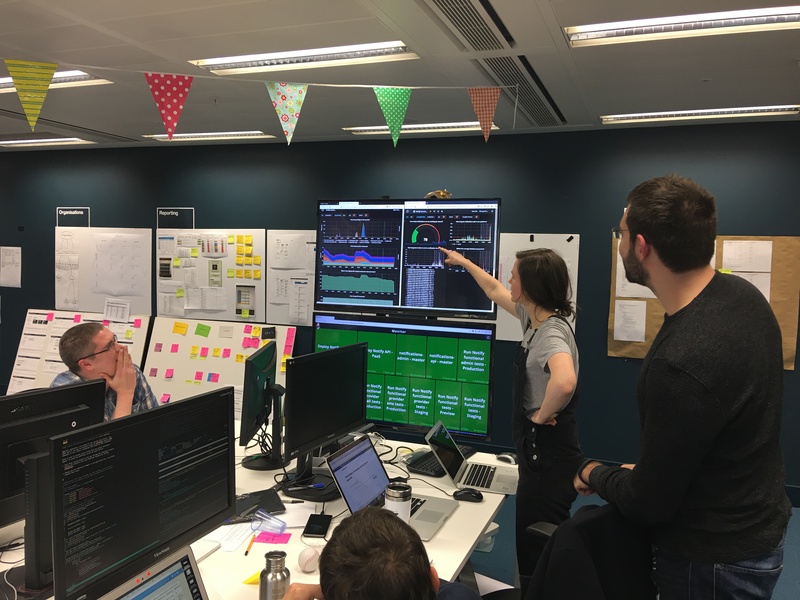 We’ve recently optimised GOV.UK Notify to make sure we can handle this significant increase in traffic and this post explains what we did to prepare. GOV.UK Notify is hosted by GOV.UK PaaS and uses the Amazon Web Services Simple Email Service (SES). GOV.UK Notify processes notification requests for our service users in the following way. The GOV.UK Notify Application Programming Interface (API) puts emails that need to be sent into a queue. GOV.UK Notify uses delivery workers (which are applications that run on GOV.UK PaaS) to pick up emails from the queue and send them out via the GOV.UK Notify email service provider. The email delivery receipts are processed by GOV.UK Notify’s receipt workers, which are applications that run on GOV.UK PaaS in another queue. Service teams using GOV.UK Notify can then choose to use the API to check whether a notification was successful or not, or they can provide an endpoint for us to post the outcome to. 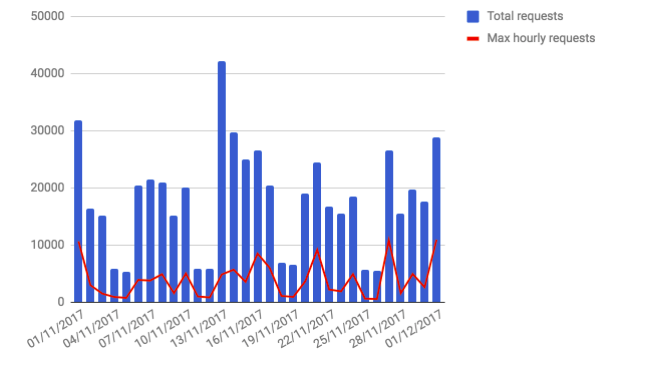 GOV.UK Notify sent between 5,000 to 42,000 emails per day in the last 60 days of 2017. We averaged sending 18,000 emails per day. Our biggest spike of requests during that period was around 10,000 requests received over one hour, as illustrated in Figure 1. GOV.UK Email is currently GOV.UK Notify’s biggest user and our peak hourly traffic is now 1 million messages per hour. GOV.UK Notify measures the percentage of messages sent within 10 seconds as a performance metric. In the last 60 days of 2017, we delivered 99.5% of messages within 10 seconds. We had to prepare GOV.UK Notify to send a peak of 1 million emails per hour, and an average of 1.5 million emails per day to meet GOV.UK Email’s delivery needs. GOV.UK Notify uses continuous integration and 3 environments - preview, staging and production. We performed the tests in our staging environment by making a copy of our production system. After we made these changes, we paired with the GOV.UK Email team to do more load testing. The Email team tested their new features on our staging environment, and we got to test our system performance. A win-win situation! GOV.UK Email went live with the GOV.UK Notify platform on 7 March and we are confident we can support an additional 500 million email deliveries per year and continue to scale. We predict the number of daily messages sent through GOV.UK Notify will continue to increase month on month as more services across the wider public sector start using Notify to meet their messaging needs. Stay tuned for more updates from the GOV.UK Notify team as we continue to scale and roll out new features. If you’re interested in using GOV.UK Notify, get in touch. Amazing scale. One question—what are you doing to stay within SES complaint/bounce rate constraints other than a double-opt-in subscription flow? It's up to the consuming user service to ensure their email list is suitably integral, on a 'soft bounce' or a 'hard bounce' GOV.UK Notify would report failure to the user service (we don't retry on their behalf), they determine what to do with that address i.e. in a 'soft bounce' they might retry later, with a 'hard bounce' they might delete the email from their list. GOV.UK Notify does monitor the number of failures and would contact a service which is having an unusually high failure rate and discuss what might be happening. It's a pity that in migrating the GOV.UK email team to Notify you've lost the ability for users to specify how often they receive email notifications. Not everyone wants instant updates for every change they've signed up for. From one email per week to 4 within half an hour, with no warning that there would be this change to the user experience, is not good, and might get this launch off to a bad start of looking like spam mailing. Hello R K, I have checked with the Notify team and following applies. Users can choose mailing frequency for everything they sign up to, and all migrated subscriptions kept their frequencies except travel alerts which were set to always be immediate given their time-sensitivity. A user can open a ticket at https://www.gov.uk/contact/govuk then we can take a look at their subscriptions to see what they currently have. Just a quick query, is there any intention to open up the Notify Support Slack channel to local government personnel? At the moment you can only sign-up to the Slack channel if you have an email address within a central government domain.